Set on either side of the meandering Rio Gilão, Tavira is a charming town that makes good use of its pretty river setting. The ruins of a hilltop castle, an old Roman bridge and a smattering of Gothic and Renaissance churches are among the attractions, and its enticing assortment of restaurants and guesthouses can make it difficult to leave. As elsewhere in the old Algarvian towns, Tavira is ideal for strolling: its warren of cobblestone streets hide shady plazas and patisseries, and despite the growing number of tourists, there’s still a small, active fishing port. The town lies 3km from the coast, near the beautiful and unspoilt beaches of Ilha de Tavira. Parque Natural da Ria Formosa. is a nesting ground and as a stopping point in migrating routes: Flamingos ( Phoenicopterus ruber ), Milherango ( Limosa limosa ), Storks ( Ciconia coconia ), King Fisher ( Egretta garzetta ), and so on. Spend some time in close contact with the nature, the wonderful world of the birds in its more natural state, and let yourself be fascinated for the enchantment of its sounds, its forms and its colors. Tavira Horse Carrige Tours See Tavira from a different perspective. Feel its history and discover the beautiful architecture which typifies Tavira. Tavira Boat Tours. Boat tours in Ria Formosa Tavira Ria Formosa as a nesting ground and as a stopping point in migrating routs: Flamingos, Milherango), Storks), King Fisher and so on. Spend some time in close contact with the nature, the wonderful world of birds in its more natural state, and let yourself be fascinated for the enchantment of its sounds, its forms and its colors. Discover the lagoon and his birds. Tavira has a pleasant setting on an estuary of the Ségua river at the foot of a hill girded by the remains of ramparts built by King Dinis. The Roman bridge and Moorish walls testify to the town’s long history. 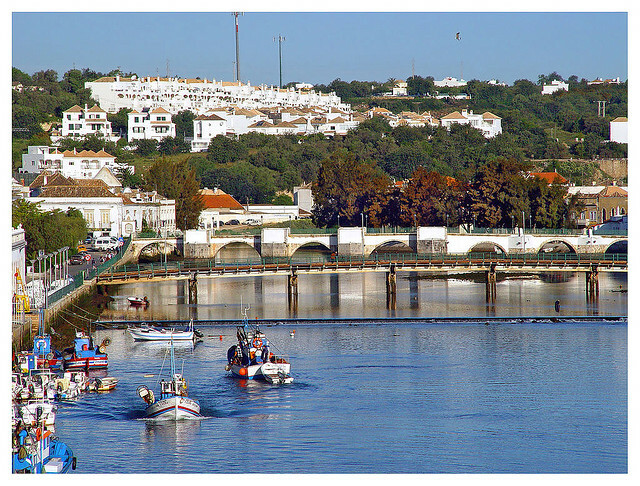 In the past Tavira was an important centre for tuna and today continues some of its fishing activities. The local beach is an offshore bar. The town in old Algarvian style has 34 churches. Castelo dos Mouros – Moorish castle with beautiful gardens. The Roman Bridge – From the square Praça da República. Banks with ATMs lie around Praça da República and Rua da Liberdade. Cota Câmbios (Rua Estácio da Veiga 21; 8.30am-1.30pm & 2.30-7.30pm Mon-Fri, 9am-1.30pm & 2.30-6pm Sat) Private exchange bureau. The Roman settlement of Balsa was just down the road, near Santa Luzia (3km west). The seven-arched bridge the Romans built at Tavira (then called Tabira) was an important link in the route between Baesuris (Castro Marim) and Ossonoba .In the 8th century, the Moors occupied Tavira. They built the castle, probably on the site of a Roman fortress, and two mosques. In 1242 Dom Paio Peres Correia reconquered the town. Those Moors who remained were segregated into the mouraria (Moorish quarter) outside the town walls. As the port closest to the Moroccan coast, Tavira became important during the Age of Discoveries, serving as a base for Portuguese expeditions to North Africa, supplying provisions (especially salt, wine and dried fish) and a hospital. Its maritime trade also expanded, with exports of salted fish, almonds, figs and wine to northern Europe. By 1520 it had become the Algarve’s most populated settlement and was raised to the rank of city.Decline began in the early 17th century when the North African campaign was abandoned and the Rio Gilão became so silted up that large boats couldn’t enter the port. Things got worse when the plague struck in 1645, followed by the 1755 earthquake.After briefly producing carpets in the late 18th century, Tavira found a more stable income in its tuna fishing and canning industry, although this too declined in the 1950s when the tuna shoals sensibly moved elsewhere. Today, tourists have taken the place of fish as the biggest money-earners.